Briya’s partnership with Mary’s Center is featured in a study by the Brookings Institution as an outstanding example of the way schools and clinics can collaborate to strengthen communities. “The combination of a school and clinic that function together as a ‘hub’ to provide health care, social services and education shows promise as a way to help improve social mobility in low-income neighborhoods,” according to the study. Briya’s partnership with Mary’s Center is featured in a study by the Brookings Institution as a valuable example of how schools and clinics can work together to strengthen communities. “The combination of a school and clinic that function together as a ‘hub’ to provide healthcare, social services and education shows promise as a way to help improve social mobility in low-income neighborhoods,” according to the study. In addition to the co-location of education, health and social services, the study cites the provision of education for parents and children simultaneously as a key strategy that contributes to Briya/Mary’s Center’s success. Researchers conclude that the combination of a dual-generation school and a clinic could be a model for others to follow. “Briya/Mary’s Center is an interesting case of how a school-clinic hub can impact the medical, social and educational health of a community, potentially laying the foundation for greater economic mobility in a neighborhood,” the study says. 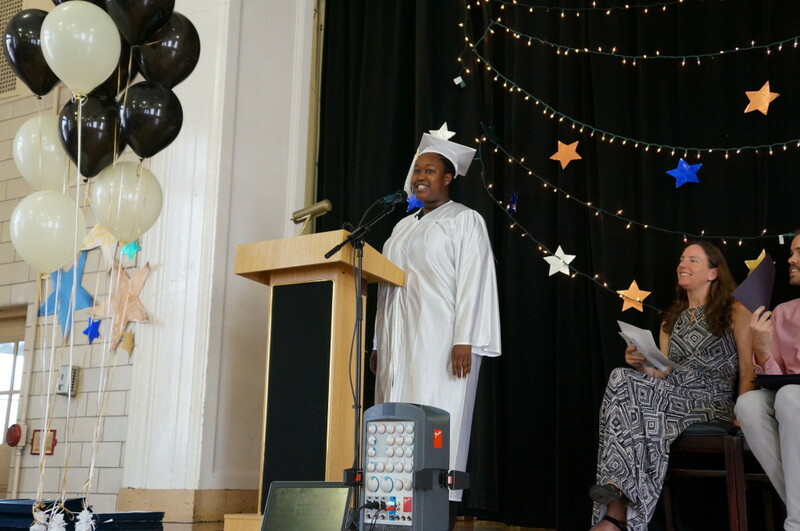 The fourteen graduates from the first class of Briya’s Medical Assistant (MA) Program were celebrated at the school’s graduation and recognition ceremony on June 23, 2015. “This is a dream that has definitely come true, and I am grateful for this program and the great people that come along with it,” said Shenell Williams, one of the MA graduates, who spoke at the ceremony. The MA Program runs for 12-15 months and prepares students for careers as Registered Medical Assistants in medical offices, clinics and hospitals. Medical Assistants perform a variety of duties, including taking blood pressure, updating patient records, giving injections, and scheduling appointments. Briya’s MA program is offered in conjunction with Briya’s longtime partner, Mary’s Center. Maria Gomez, Mary’s Center president and CEO, spoke at the ceremony about how the program demonstrates the valuable partnership between the school and the center. Four of the MA graduates, including Williams, have already been offered and accepted MA positions at Mary’s Center, while another has begun working as an MA for MedStar. Additional students have also received job offers.